Red Pepper Chili Beer Bread. Molten Fudge Beer Cake. Beer Fudge Cookies. Corn Beer Bread. For Lin Johnson-Carlson of Mimi’s Mountain Mixes, it’s all about that special ingredient. Is there anything more synonymous with grandmotherliness than baking? A floral apron dusted with sugar and tied tight around a warm waist; the scent of baked things that catches in curled perms and slick buns alike; the gesture of a timeworn finger, coated in slick dough and proffered to the open mouth of an eager grandchild. Baking is familial, as warm and sweet as a mother’s hug, but it’s principally the realm of grandmothers, grandmas, maw maws, and, as of recently, Mimis. Or, more accurately, a Mimi. Walking into the headquarters of Mimi’s Mountain Mixes, home of simple bread mixes to which you add one mere beer, is like stepping into your own grandmother’s kitchen, but on a grand-er scale. Flour and spices sift through the air to settle on hairnets and in the smile lines around eyes. Scents also swirl in the air, especially when it’s time to prepare the mix for the company’s seasonal specialty, Punkin’ Fest Beer Bread. Lin Johnson-Carlson, known affectionately as “Mimi” to her three sons and ten grandchildren, and now the world, is full of this kind of contagious laughter and dad-sic-grandmother jokes. But like all good grandmas, it’s not all laughs; Mimi is also prone to pithy, idiomatic wisdoms, nuggets of insight served cool between those effervescent bursts of optimism. When she tells the troubled story of her last office job, she concludes with a sage observation: “You have to do your best, and if you do your best, the rest will come into place.” She pauses, looks you in the eye, a wide smile breaking across her face as she moves on to the next idealistic tangent. It’s the same threads of optimism and wisdom that weave through conversations with your shrewd grandmother, hands wrapped around warm cups of strong coffee, with fresh-baked bread on the table. We get sidetracked, talk about the value of family and optimism and kindness. But although beer bread is far down the line for both God and even Mimi, for us, it’s the subject. The first question is the obvious one: How did she become a peddler of beer bread mixes? You might think the answer is as obvious as the question, a tale of hours logged in commercial kitchens or culinary school, but the answer is, in fact, as antithetical as possible. “I was a mortgage loan officer for 25 years and a realtor for seven years before that,” Mimi notes, adding that she began her career in real estate in 1978. It’s nearly impossible to imagine this image of motherly benevolence throwing around words like “mortgage” and “brokerage,” but for a long time, she did just that. In 2005 Mimi received an offer she couldn’t refuse. She traveled south from her home in Ohio to Fort Myers, Florida, one of the fastest growing real estate markets in the country. As a mortgage loan officer for Wachovia Mortgage, she managed two counties; the market was seemingly boundless. Until suddenly, it wasn’t. 2008 came, and with it the collapse of the greatest real estate boom in America’s history. Those regions that were so recently buoyed by fast sales sunk the fastest—particularly in Florida. “I’d had a lot of ups and downs in the industry, but always weathered those storms; but then I was like ‘okay…’” Mimi remembers, of the crash. Paired with a host of other seemingly unweatherable odds—including a divorce from her husband of 33 years, also in 2008—and the road before her must have felt like being in a tunnel. But there was a warm light at the end—the glow of an oven light. Mimi laughs and shakes a knowing finger in that classic salute of advice. “It got to the point where I’d sell out every single Saturday.” Moist breads spiked with the sweetened tang of fruit appealed to Florida’s natives and visitors, a sunshiny vacation baked right into every slice. And a fresh start, in Hendersonville, is exactly what Mimi found. A new love with now-husband Gene. A sweet home in the woods. Days of respite spent floating down the French Broad and hiking muddy trails. And at the center of it all, a new business. With a justly-earned bankroll, a hearty supply of optimism, and an idea, Mimi’s Mountain Mixes was born. It was the final affirmation Mimi and Gene needed to commit to Mimi’s Mountain Mixes. They rented a space in the basement below Dandelion Café in Hendersonville, carting weighted, industrial bags of flour and sugar down steep stairs. (Mimi: “We’re old! It was aging us!”) Production grew quickly, as did their staff, a collection of young women gathered from less than perfect circumstances, often the local shelters, in need of stable employment. True success came with their expansion into new commercial markets. Mimi reached out to local grocers and franchised powerhouses alike, pitching her mixes. “The answer’s always ‘no’ if you don’t ask, and I’m not above asking—a couple times,” she remembers. And it worked. Today you’ll find Mimi’s Mountain Mixes in scores of regional grocery stores, including Harris Teeter, Publix, Lowes Foods, Ingles, and soon Whole Foods, sprinkled across the Carolinas, from Raleigh to Greenville, and up into Ohio and Tennessee. Nearly 60 stores in total, including boutiques and, of course, specialty beer and wine shops. With that extensive and expanding market, Mimi’s Mountain Mixes has to maintain a swift and organized operation. These days, they do that from their new, recently expanded offices in Hendersonville. Half of the space is used for production. Stainless steel tables hold big mixing bowls in a similar sheen. Production manager Daniela explains the process of creating and packaging the mixes. The rotund bowls before her are filled with dusty, good-for-you ingredients: non-GMO, unbleached, and unbromated flour, sugar, and spices. Each of the six bowls holds 12 mixes, 72 mixes in total. On the next table, another employee divides the finished mixes into sandwich bags, which she plops into paper coffee bags and stamps and stickers with batch numbers and labels. It’s a process that occurs three to four times per day, producing some 200 mixes every day on Wednesday, Thursday, and Friday. Daniela smiles as she points at the powdery goods before her, white fingerprints staining her jeans, a smudge of flour across her cheeks. It’s easy, she points out. And it is. Mimi’s territory, recently acquired, is the adjacent office. Part storage space, part breakroom, part office, it’s where Mimi convenes to perform the more tedious tasks of the business. Ask her her least favorite part of her job, and her response is immediate, accented by the frustrated flinging of her hands into the air: “Paperwork!” Here, Mimi completes that laborious paperwork, fills orders, chats with clients and retailers. It’s where she drinks her coffee and, on late nights, eats her dinner with Gene. Gene himself is now a full-time employee of Mimi’s Mountain Mixes, too. Retired from the banking industry, his province isn’t in the office, but on the open road. He travels constantly to check on their retailers, a schedule that gets him to every store every seven to ten days. “He’s a very people person, so he loves going in, taking to the manager, chatting with folks,” Mimi notes. “We would never have grown so much without Gene being so hands on.” You’ll also find Gene in Mimi’s old stomping grounds, manning the booths and tables at farmer’s markets across the mountains. The hard work—and tireless tasting—always pays off, most recently with her beer soft pretzel mix, which quickly became their best seller. Other recipes range from savory to sweet, including a Red Pepper Chili Beer Bread, Italian Herb Beer Bread, Molten Fudge Beer Cake, Cinnamon Spice Coffee Cake Mix, Beer Fudge Cookies, and Corn Beer Bread, all retailing for a reasonable $6.95. And Mimi’s fiddling with even more mixes, including doughnut and biscuit recipes and, to be released very soon, a beer pancake mix. New recipes aren’t the only thing Mimi has up her flour-dusted sleeve. She’s already refining their online marketplace (at MimisMountainMixes.com) and gift basket selection, pairing mixes with handy pans and cute accoutrements. A commercial line also seems to be in the cards for Mimi’s: Ten pound bags of the most popular mixes, hand-delivered to local restaurants and food service stores, where chefs can quickly whip up beer-fueled breads to pair with dishes for diners. Another possibility is fundraising. Rather than asking kids to go door-to-door with order forms for citrus or those curly shoelaces, why not outfit them with bags of delicious Mimi’s mixes. It’s easy to imagine Mimi’s mixes as the puzzle piece in a modern 2017 bake sale. Perhaps the largest and loftiest designation on Mimi’s resume is “author.” She’s currently writing a book, Outrageous Optimism: Surviving and Thriving in a Wacky World! And although it would be easy to dismiss this as an unrealistic aspiration for other entrepreneurs, for Mimi, it just makes sense. Sharing her particular, unshakeable brand of optimism with the world doesn’t seem grandiose, but more a humble gift—a matronly passing of wisdom. Mimi’s is a company rife with traditional measures of success. Sales are booming; expansion is constant; innovations, frequent. Not long ago they entered a competition hosted by the Henderson County Chamber of Commerce. They submitted their business plan alongside a host of other local pursuits, and subsequently won the Chamber’s Small Business Award. Accolades include a billboard, advertising in newspapers, and business counseling advice (not that they seem to need it). Though she dreams of influencing other businesses and extending that helping hand to even more women, for now she’s content to share her love with the ladies already at her side. When an employee comes in to grab her bag at the end of the work day, Mimi stops the conversation to bid her adieu, sharing smiles and giggles and a final farewell, along with the words—emphatically yelled as her heels pass through the door—“Hugs and kisses!” It’s the kind of sweet send-off you’d expect to receive from your own grandmother, accented by a sugar-dusted kiss on the cheek. For Mimi, family is her business model. She treats her employees with the same gracious kindness as she would her own family. On an even larger scale, family is her life model. She shares her mixes with a large community, infusing each recipe, even each bag, with her honeyed, familial good will. Every bag of Mimi’s Mountain Mixes carries a special message, a syrupy sweet note that portends her personal interest for every single buyer: “Mimi would put your picture in her wallet (if it was big enough), but she won’t put these icky things in this mix: no bleached flours and no soy, no aluminum, no eggs, and no dairy, no trans fat.” Another bag’s love letter begins, “Mimi loves y’all. She would put your picture on her fridge, but she’d never put these icky things in her mixes…” It’s these sentiments, so genuine and gentle and homey, that define Mimi and her mixes. Ask Mimi her one hope for her breads and the folks who eat them and her response is immediate. “Feel the love,” she answers with a grin and a nod. 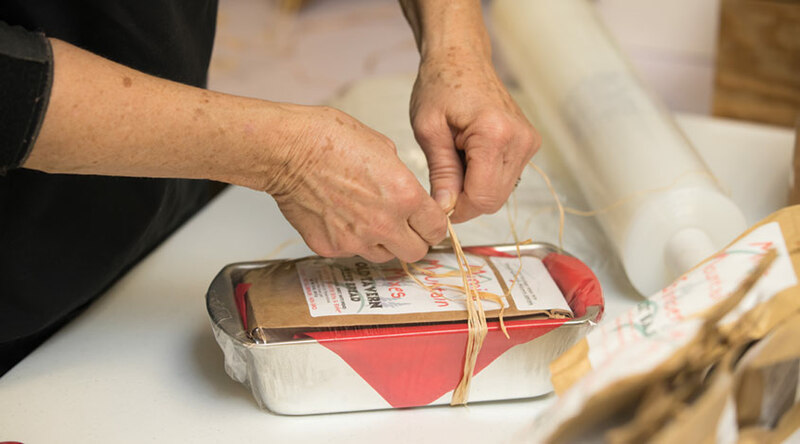 “Feel the love in us here, in our products, in our mission, and even on our bags.” Like every recipe ever authored by a grandmother, the secret ingredient in Mimi’s Mountain Mixes is simple: love.